I read this blog post this morning and really enjoyed it. “Top 20 Do’s and Don’t’s of Blogging”. The focus was to the professional blogger and so some of the topics may not necessarily apply for student blogging. The other thing is that it contains a lot of don’t’s which sound a lot like rules and you know students (and teachers) when it comes to rules – they want to push to see how far they bend before they break. Inspired by this, I thought I would take a look at putting together a list of Do’s specifically for schools. It’s all positive! DO – Follow the school’s acceptable use policies for social media. This might include just using student first names and last initial or a particular tool. No problem. The goal is the writing after all. DO – Use a graphic organizer to brainstorm thoughts before sitting down to actually blog. I’m a big fan of Popplet. DO – Use all the components of the writing process. After all, you’re writing – Prewriting, Drafting, Revising, Editing, Publishing are all nicely done online and “pass the laptop” peer editing with elbow partners works well. DO – Publish for others to read and comment. Parents always enjoy the opportunity to see student work live and immediate and can comment right on the spot. I had an advantage explained to me once by an eLearning teacher that I hadn’t thought about but it sure makes sense. By publishing so that others could read, plagiarizing went away totally – first of all the original author might find it and secondly classmates would rat them out! DO – Use the hashtag #comments4kids. There really are kind souls that like to support the blogging process by adding a comment now and again. DO – Simplify the writing process. Depending upon student age, why use a big, full-blown word processor with every bell and whistle known to human kind unless you like the myriad of teachable moments when the question “What does this do?” comes up? Your blogging environment may have just the right number of options for most writing! DO – Include images. Not the “go to Google Images page and right-click the first one” ones though. Discuss Creative Commons resources (including Google’s) or, even better, have students create/photograph/scan their own artwork for inclusion. Make it theirs. DO – Blog in other languages. What a great way to promote a second language than to publish it in the best possible, polished format. Don’t forget that mathematics is a wonderful second language too. DO – Blog regularly. I would suggest that “one and done” is just a waste of time. Make it a regular place to publish or journal what’s happening. A comparison of writing at the end of the year will show how the writing has matured. Don’t forget also to create a BlogBooker so students have a record of everything in one spot. DO – Consider your back. Instead of loading up your personal knapsack full of papers to take home for marking, do it online! You can easily use all forms of assessment publicly on the blog or privately through your wiki or email. What do you think? Blogging in the classroom is positive. What did I miss? Add them in the comments below. Thanks for a great post, Doug. I especially love the link to parent engagement through classroom blogging. Many educators wonder how to get families more involved in student work, and regular blogging can do it when students realize the excitement of publishing to the web. If teachers can make blogging part of the classroom culture, it can flatten the walls of the classroom. 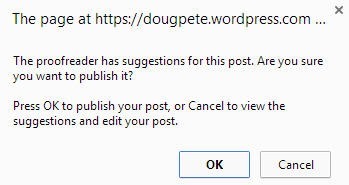 Love your “DO’s” for blogging, Doug. I also have other easy resources bookmarked. Reach out via my contact form (or your students can), and I’ll be happy to help! Oh, and I have one on blogging platforms that might help, too. I love helping students get ahead. I wish I’d had these resources when I was at Oglethorpe University years ago. Thank you for sharing your experience, Amberr. We all win when we share and get better. Thanks also for your original post. You had some great ideas there. Thanks for this – where do you get the proofreader from? I could really use that! From the sidebar, select Users and then Personal Settings. Near the bottom is a section titled Proofreading and you can pick and choose what you want it to look for. I have them all selected. I need all the help I can get. For elementary and middle schoolers, Kidspiration is another good graphic organizer that I like to use. Many teachers are hesitant to push the PUBLISH button, but once they do, a great dialog can begin. Be brave, Grasshoppers! When project timelines allow, I have the kids create and use their own illustrations. Anyone can download a ready-made picture but only YOU can illustrate a pond the way you have chosen to. Pride of ownership makes students hungry to do it again. NOW! I heartily agree with your comments re “one and done.” Repetition is the Mother of Learning…the more frequently we try, the easier it is to achieve our goals.